The emotional toll of being chronically ill is HUGE. Most of the time you have to hold it all together and put on an mask and smile because life has to go on because there is no magic cure but then you get moments where you just crumble and you find yourself wrapped in wet towel crying because the burden of holding it all together became too much. That was me tonight. Just the thought of getting dressed too tiring let alone the thought of getting through tomorrow. Knowing you will have unrefreshed sleep because I can never get comfortable and another day of relentless pain, debilitating fatigue and the unknown and unpredictability of what symptoms I will have, or how many falls or seizures I will have. The unpredictability brings a lot of anxiety and a few weeks ago I had a really bad seizure a church resulting in paramedics being called and that's taken a huge knock to my confidence, especially leaving the house. Simple things can can set me off sometimes, like tonight. I can find myself getting angry or frustrated or upset over spilling coffee granules because of my tremor or myoclonic seizures, or people not understanding me when my speech is slurred or stuttering, or my continence pad leaking and having to change my clothes or bedding at 4am. But in that moment those small things become big things. It's like chronic illness is a cup and every minute of pain, or being too tired to move, or spilling a drink etc is a drop of water into that cup and it gets to a point where that cup overflows and you breakdown because you can't contain it anymore. For me I see my specialists in London every 6 or so months but in-between then I get little medical support so I feel like I see them and then I'm left on my own. Everyone seems so wrapped up in my physical health that the emotional toll of my health gets forgotten about. I'm under mental health services for my mental health but they're so clueless about my physical health that they're not much help either. It's not just the medical burden of symptoms but the day-to-day activities that become an emotional burden because of how difficult they are to do. Things that able-bodied people take for granted and don't think twice about being able to do like getting dressed, or having a wash, or getting up to make a cup of coffee. I think the emotional aspect of being chronically ill is the most invisible and sometimes the worst aspect. As well as having to deal with the illnesses themselves comes all the admin which is also emotionally draining. The phones calls and emailing which is exhausting especially when you get bad news and so you have so sort that out or there's a meeting so you need to invite this person and that person and you have little help in doing that. It really is hard to sum up, especially to able-bodied people how emotionally overwhelming being chronically ill is and I find myself typing here over the past few days putting this post together getting frustrated trying to find the right words to get across what it is I want to say in explaining the emotional toll of being chronically ill.
You become sick and tired of being sick and tired. And there's no let up; no days off; no hours or even minutes where I'm symptom free. Being ill and disabled is my full time job and it's a job I didn't choose and one I can't resign from. 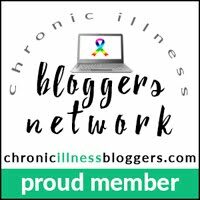 I'm not quite sure how to end this post but it was a place to vent and explain that there's a whole emotional side to being chronically ill that people with chronic illness and disabilities have to live with. And for those whose illness or disability came later in life there is also the loss of the life we had before. My advice to able-bodied people is if you have a friend with a chronic illness/disability is just simply be a friend and listen to them - a chat over a cuppa can go a long way. Or ask if there's anything you can do to help. But also remember that there is more to a person than just their illness and it can be nice to talk about other things too which gives us a nice distraction from the illness that we're having to deal with on the inside.